It had promised to be a Tournament showcasing the best of the continent. In the end it was won by a Portuguese squad, who despite boasting one of the greatest players in the history of the game (not to mention a more than adequate supporting cast), stuck with its safety first mentality to defeat the host Nation of France, who themselves would not have been particularly worthy winners. Most would be hard pressed to find a truly deserving winner for a Tournament that dragged on longer than it should have. Therein lies the major problem for this edition of the Euros. In the decades past, the Euro Finals were restricted to eight teams only (the hosts and teams that had won their qualifying groups outright). Starting the 1996 edition, the number of participants was raised to sixteen. This seemed like a good balance, the Tournament had the feel of a mini World Cup without losing quality. However, UEFA (no thanks to Michel Platini) had the grand idea of increasing the number of participants even more to 24. The reason needless to say was economics, but by doing so they increased the quantity, which directly decreased the quality at hand. UEFA contains slightly more than 50 members; therefore roughly half the members participated in the Finals. To make up the numbers, playoffs were needed between Nations who had finished third in their qualifying groups. While many Nations’ fans were overjoyed to see their Nation in the Finals after so many years of absence, it went against all sense of fair competition to have third placed teams in the Finals of a major Tournament (Turkey, Ukraine, Republic of Ireland, Hungary and Sweden advanced in such manner). It was also a year of many firsts as traditional absentees Iceland, Albania, Wales and Northern Ireland qualified. Wales had been absent from the Finals of any major competition since 1958. France had last hosted the Finals in 1984 in relatively simpler times. In fact the success of those Finals had kicked off the Euros in high gear and made it the most important Football competition after the World Cup. Michel Platini, the player and Captain, was at his zenith and scored nine goals to lead France in its first major trophy. Platini, the Administrator, was conspicuous by his forced absence (due to his suspension from the FIFA Ethics Committee). Didier Deschamps, who as a player, captained France to victory in the 1998 World Cup as well as the 2000 Euros was tasked with building a squad to triumph at home just like 1984. Unfortunately, his squad was not as talented as the Platini/Giresse/Tigana generation of 1984 nor his own generation led by Zinedine Zidane that contained the likes of Thierry Henry and Laurent Blanc among others. France’s hopes were to be carried over the shoulders of new leaders Paul Pogba and Antoine Griezmann. Unfortunately, despite a late burst of goals from Griezmann, neither rose to the occasion in a manner of a Platini and /or Zidane. Pogba and Griezmann have the talent and the potential to succeed at the highest level but clearly lacked the match (and Tournament) winning personalities of their glorious predecessors. Griezmann finished as top goalscorer, but he was guilty of missing a glorious chance in the Final. Deschamps was also criticized for constantly tinkering with his formations (sometimes even during matches). While this may have suggested the symptoms of an unsettled side, his positional switches worked, especially in overturning a deficit in defeating the Republic of Ireland. Deschmaps seemed unable to place Pogba in an ideal position to exploit his talents. France seemed hesitant at times and only impressed in patches during matches. In fact, it is hard to remember a match that they dominated completely from start to finish. In the end the match against Portugal seemed one match too many fort France to maintain their late momentum that reached its height in defeating Germany in the semifinals. Deschmaps’ success was getting this ‘not yet ready’ side all the way to the Final. France’s surprise package was Dimitri Payet, who made the Finals squad after a successful season at West Ham United. His winner vs. Romania in the opener made him the toast of the Nation and an unlikely early Hero. Newcastle United midfielder Moussa Sissoko also helped to improve France once Deschamps chose to start with him. If the previous World Cup could be dismissed as an accident, these Euros confirmed that Spain’s Era, as a power appears to be over. Despite opening up solidly with two wins, no one could blame misfortune for their defeats against Croatia and Italy. Vicente Del Bosque stepped down after eight years and some players may also follow. As far as Italy, they flattered in the early going for their tactical discipline. They played efficiently as a unit, especially the defensive end. Many praised the ever-youthful Gianluigi Buffon’s rapport with his Juventus teammates in defense (Chiellini, Bonnucci and Barzagli). Perhaps they were unlucky that in the Quarterfinals, they were paired with Germany. Germany had advanced as always by efficiently defeating weaker opposition. Thomas Muller had been disappointing by his standards and injuries had forced the recall of Mario Gomez, who had been out of International reckoning for many seasons. The first round had been such business as usual that for the Germans the talking point had been Joachim Löw’s hand movements on the bench (I will spare the details). As always the Germany-Italy matchup will be considered a classic in the history of their encounters. But this was THE worst penalty kick shoot-out that I have witnessed. The Italian Simone Zaza’s run-up to take his spot and the ensuing miss was virally parodied mercilessly. And what can be said of England and Roy Hodgson. Unlike their Welsh neighbors who rose to the occasion and reached the semifinals, the English never impressed with Rooney a major disappointment in perhaps his last Finals of any kind. For Wales, Bale rose to the occasion as did Aaron Ramsey, whose absence cost the Welsh significantly in the semifinals. England Manager Roy Hodgson failed to bring out the best in a youthful squad and resigned after the shock elimination against Iceland. 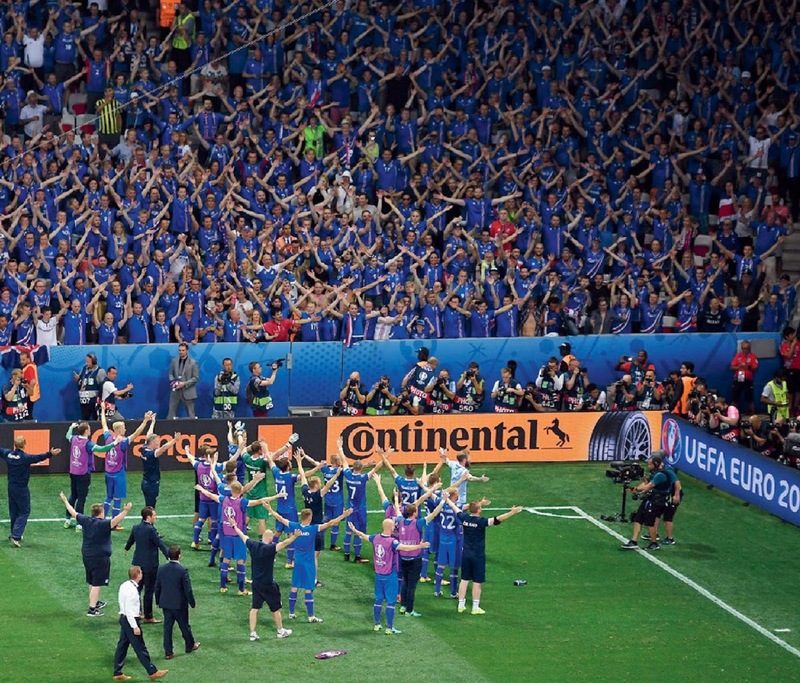 Speaking of Iceland, if you had a heart, you had to be on the Iceland bandwagon. They reached as far as the Quarterfinals and were soundly defeated by the hosts (2-5), though they did manage to show some French defensive deficiencies in the second half of that match and did not give up until the end. 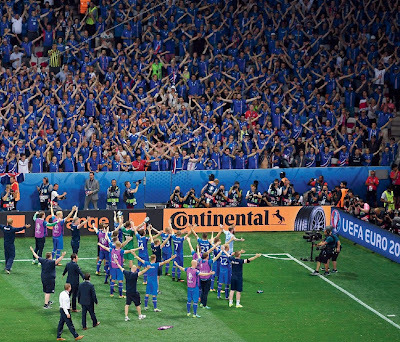 The Iceland Clap-Chant led by Team captain Aron Gunnarsson at the end of matches is sure to remain as one of the highlights of an otherwise emotionless Cup. Although at times the praise went overboard (If I had a dollar every time I heard commentators make statements such as: “This is a Nation with a population of only 330,000…. This is similar to what Leicester did in the EPL this season…..About a decade ago they decided to set up a program to develop better players, etc…..”. Since we live in a viral age, a day would not go by where something would pop up on Facebook on the events on and off the field. The most noticeable were the Irish fans. There would be a barrage of viral videos on a daily basis showing the warm nature of the Irish fans. These included events such as ‘cheering for the French Police’, ‘Singing to help a baby sleep on a train’, ‘serenading beautiful women in the streets’, etc. Despite the praises, Republic of Ireland’s Assistant Manager, the fiery and competitive Roy Keane actually criticized the mentality of the Irish fans for being too eager to be liked. As far as Northern Ireland’s, their song “Will Grigg’s on Fire” about the Wigan Athletic striker also became a viral hit (even though, the player did not play a single minute). We also had to relive the emotional commentary of Icelandic Television Reporters when describing Icelandic winning goals. Many likened these to the Norwegian Commentator after the 1981 World Cup qualifier on September 9, 1981 (2-1 Norway win over England). And finally, to sum it all up, “The Commissioner of Football”, Eric Cantona had to get in the mix and comment on the events of the day and even sang “Will Grigg’s on Fire” on one occasion. In the end we should be thankful that Eder’s goal in the overtime at least spared us from a penalty kick shoot-out. Portugal earned its long overdue title as a Nation, but did it in such a miserly way that most pundits compared them to the Denmark of 1992 and especially Greece of 2004, before the trophy and medals were even handed out. It’s virtually unprecedented for a team that only won once in regulation during an entire Tournament to be triumphant. Not many would have bet on them after they were unable to defeat teams such as Austria, Iceland and Hungary that were very much for the taking (at least on paper) in the First Round. Just to think that they advanced as the third best team in their Group also makes a mockery of the new Tournament format. Naturally Cristiano Ronaldo will take all the plaudits and has finally won the International trophy that he craved. Although his detractors will repeatedly point out that he was not even on the field at the moment of his Nation’s greatest triumph. Given this triumph, we are unfortunately still set for the unending Cristiano Ronaldo-Lionel Messi duopoly for the Ballon d’Or and of course this time CR7 will edge ahead. He certainly did not dominate the Tournament the manner in which a player of his caliber should, but neither did anyone else. In fact it is hard to distinguish a single team, nor player, that truly rose above the competition and dominated it reminiscent of France with Michel Platini in 1984 and Holland and Marco van Basten in 1988 to name just two. The Tournament spanning a whole month in the end felt long, by a week or two. This may have actually longed some fans for the days of Eight Team Finals. But alas, we are sure to be stuck with this format. This may turn out to be Platini’s biggest mistake as an UEFA Boss. 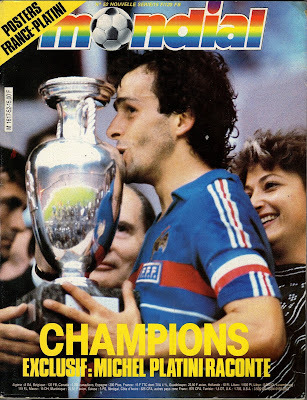 Platini, the player, dazzled the continent as a player in 1984 like no other on the same soil. Thirty-two years later as an Administrator (even if absent), he has tarnished his legacy by kick starting a bloated and listless Tournament on the same soil.